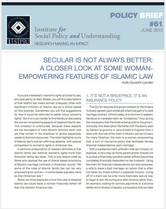 If you are interested in women’s rights and Islamic law, you have plenty to read. Mostly, you will find descriptions of how Islamic law treats women unequally, often with significant criticism of Islamic law as a whole based on this premise. Sometimes you will find suggestions for how it could be reformed to better honor women’s rights. But it is much harder to find literature discussing the woman-empowering aspects of classical Islamic law. This omission is unfortunate, because these aspects are the foundation of most Muslim feminist work and yet they remain in the shadows of global (especially western) feminist discourse. This brief highlights some of Islamic law’s woman-affirming aspects, with special comparison to women’s rights in American law. A common presumption of western feminists is that Islamic family law restricts women’s rights more than American family law does. This is one reason cited by those who oppose the use of sharia-based provisions of Muslim marriage contracts in American courts. Yet some of the rules of Islamic family law can be very empowering for women—in some cases arguably more so than American law. Below are three examples of how the rules of classical Islamic law could leave a woman financially better off.